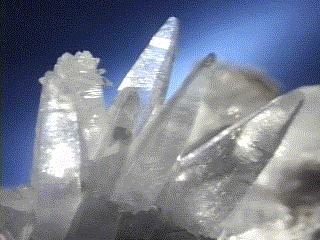 The beauty and symmetry of crystals have fascinated people for thousands of years. Somehow, they seem different from more ordinary matter. 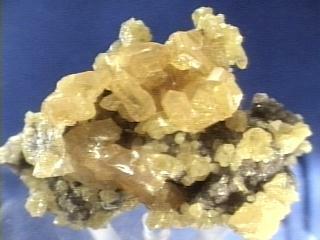 However, most solid objects are made of many tiny interlocking crystals. It is only occasionally that the individual crystals are large enough to catch our attention, as in these beautiful examples. Celestite Sulfur Pyrite The above images are the property of Amethyst Galleries, Inc., and may not be copied for commercial purposes. Permission to copy descriptions and images is granted for personal and educational use only. Refer to http://mineral.galleries.com/ The atoms in a crystal are in a regular repeating pattern called the crystalline lattice. Although the existence of this lattice has been known for many years, recently the scanning tunneling microscope (STM) was invented. This allows us to see individual atoms. 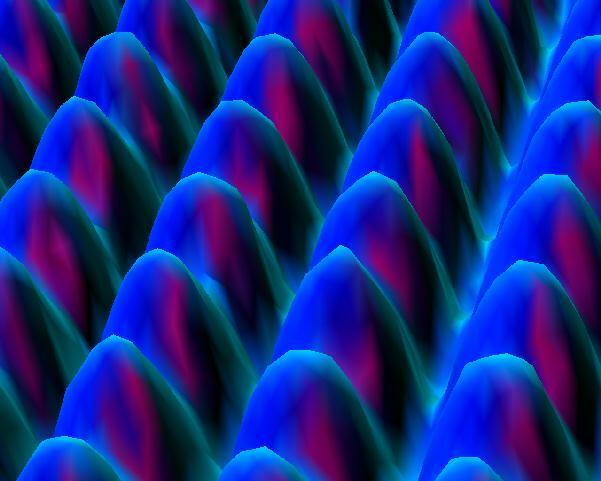 Below is an STM image of a platinum surface. Note the regular rows of Pt atoms. This image is the property of IBM Corporation. The lattice can have a profound influence on the material's properties. 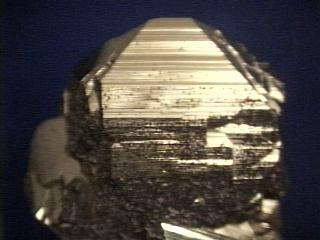 For example, below we see two crystals - graphite and diamond. They each contain only 1 kind of atom - carbon. The difference is in how those atoms are arranged. Graphite Diamond The above images are the property of Amethyst Galleries, Inc., and may not be copied for commercial purposes. Permission to copy descriptions and images is granted for personal and educational use only. Refer to http://mineral.galleries.com/ Graphite is black, soft, and an excellent lubricant. This suggests that it must be easy to separate atoms in graphite, or at least to make them slide past one another. Diamond is transparent, strong, and very hard. It is a superb cutting tool. The atoms in diamond must be very strongly held in position. Chemically, diamond is inert. Graphite, on the other hand, is very useful for absorbing and catalyzing reactions. The structures of diamond and graphite explain these differences. The carbon atoms in diamond are each bound to 4 others in a 3-dimensional network. To change the shape of a diamond or break it requires that many of these strong bonds be broken simutaneously. Since there is little room for other molecules to get into the structure, diamond is not very reactive. Click on the image below to view the structure of diamond. Graphite consists of sheets of strongly bonded hexagonal rings. Each sheet is far from and weakly bound to the next. Thus, the sheets can slide past one another, making graphite a soft lubricant. The spaces between the layers allow other molecules to enter, explaining the absorbing and catalytic properties. Click on the image below to view the structure of graphite. The structures of graphite and diamond have long been known. However only recently has the scanning tunneling microscope (STM) given visual confirmation. Shown below is an STM image of a graphite surface. This is an actual image, not a simulation. It clearly shows the interconnected 6-membered rings of graphite and the triangular geometry about each carbon atom. Used with permission TopoMetrix Corporation 5403 Betsy Ross Drive, Santa Clara, CA 95054 Boron nitride also exists in two different crystalline structures. Click on each image below to view that structure. Hexagonal Boron Nitride Cubic Boron Nitride Click here to go to next page.